Nearest beach is about 15 minutes ride by car, nearest golf course is approx. 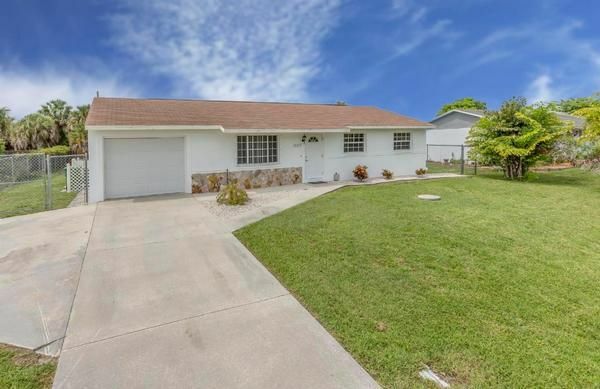 20 minutes ride by car.This vacation home is located in Port Charlotte, FL 33948. The nearest airports are Fort Myers (RSW) and Sarasota/Bradenton (SRQ), both of which are about a one-hour ride by car; Tampa (TPA) is located at a distance of about 2 hours by car, Miami (MIA) about 3 hours. The home is located in a regular residential zone. Our offer is addressed to travelers, who don't feel comfortable in a typical touristical surrounding. Rental fees include all applicable taxes, electric, water, sewage, heating, cooling, internet. Consumables (gas, soap, toilet paper and the like) and groceries are not included in the rental fee. Final cleaning is charged only if necessary. The rental fee is unaffected by the size of your party. Less than a 3 hours by car will bring you to the big theme parks in Orlando or to Miami. You'll get to the Everglades in less than 2 hours by car. Twenty-one golf courses, tennis courts (10 public) and public pools, as well as four YMCA”S get lots of use from residents. The waterways are sites for a host of competitive events, including fishing tournaments and boat/yacht races. If you don’t own your own boat, chances are you can rent boats and jet skis just about anywhere. TV-entertainment is digitally received by antenna; viewer may select out of approximately 45 programs, including spanish languaged program, religious content and shopping channels. About 15-20 programs provide entertainment in English language. For more entertainment there is always netflix, hulu and the like. The refundable security deposit hat to be paid in advance to the owner by card or money transfer. Handover possible from 3pm; handover until 7pm is free of charge; 7-9pm: $30 surcharge;9-11pm: $50 surcharge; after 11pm: $70 surcharge. General: once per object Costs amounting to 100 EUR (Mandatory). Port Charlotte encompasses the unincorporated area of Charlotte County and is comprised mostly of single family homes with a spattering of condos and town homes. The population of unincorporated Charlotte County, including Port Charlotte has approximately 127,500 residents. Covering 820 square miles, Port Charlotte is located north of the Peace River with 165 miles of canals and waterways accessing Charlotte Harbor and the Gulf of Mexico. There are also miles and miles of natural shoreline bordering the Peace and Myakka Rivers, making it an ideal choice for waterfront living and recreation. In all, 14,004 private boats, 28 marinas, 15 public beach access sites, 13 boat ramps and two sailing schools dot the county&rsquo;s extensive shoreline. The county also boasts about two dozen parks, numerous recreation areas and a federal wildlife refuge. The Charlotte Harbor Environmental center spans 840 acres, providing nature trails, picnic areas and enrichment programs. The Cecil M Webb Wildlife Management Area is another favorite with locals. The 100-acre game reserve offers hunting, fishing, frogging and camping. Eco-tours through parts of the 90,000-acre Crescent B Ranch in eastern Charlotte county allow visitors to see the old, original Florida. Swamp buggy trips through Telegraph Cypress Swamp provides plenty of adventure with views of wild turkey, alligators and more. It&rsquo;s also worth noting, the Everglades National Park, one of the most spectacular natural ecosystems in the United States, is only a short drive away. Twenty-one golf courses, tennis courts (10 public) and public pools, as well as four YMCA&rdquo;S get lots of use from residents. The waterways are sites for a host of competitive events, including fishing tournaments and boat/yacht races. If you don&rsquo;t own your own boat, chances are you can rent boats and jet skis just about anywhere.